This is your free Hong Kong City Guide! A busy, bustling city with fantastic food, impressive shops, a vast array of sky scrapers and some pandas thrown in for good measure. We went for our honeymoon and we can thoroughly recommend it. Victoria Peak – Also known as simply “The Peak”, this is the place to head to for an unparalleled view of Hong Kong. The tram ride to the top is sometimes a squash, but the views are stunning. The air is also noticeably cooler. The iconic Peak Tower at the top, now has an array of restaurants and shops. Think carefully about when to go up the peak – just before dusk is good, but try also to avoid hazy days. Catch the tram at Garden Road – it’s well signposted. The Streets Of Hong Kong – For us the joy of being in Hong Kong was soaking up the culture and to do that you simply need to walk the busy streets of the city. Two areas in particular are worth exploring. 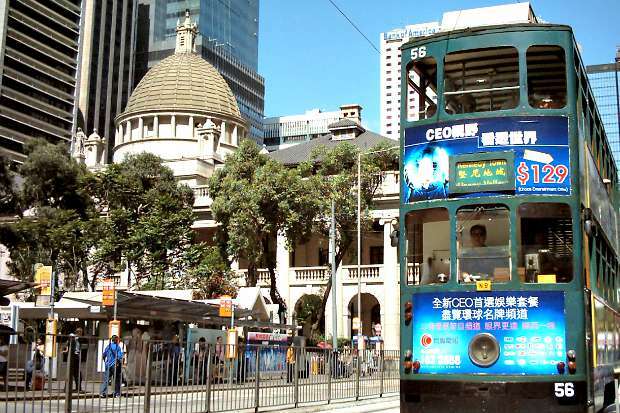 The city centre itself with its vintage trams and huge skyscrapers and top of Kowloon island near the Star Ferry port where you’ll find streets packed with tailors, Chinese medicine stores and great places to eat. 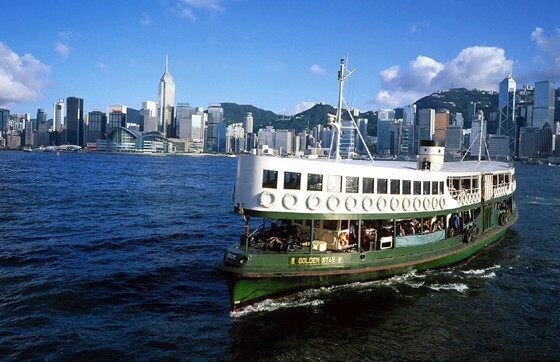 The Star Ferry – These ferries are as much an icon of Hong Kong as the skyline! The main route links Hong Kong Island and Kowloon and they’re also a great way to see the skyline from the water. We loved travelling on the ferries because you get a real taste of Chinese life on board with commuters and tourists all mixed together. The crossing is very cheap too. Catch the ferry at the Central Star Ferry Pier. They also do a harbour cruise. 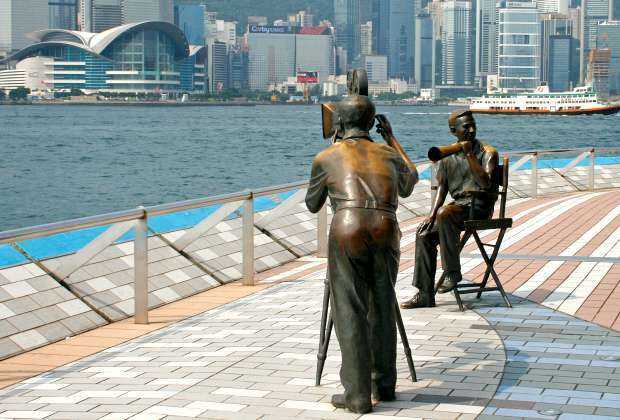 Avenue of Stars – You’ll find this on Kowloon just along from the ferry port around the outside of the New World Centre. You may not know all the names on the Hollywood-style stars, but this walkway provides the best sea level view of Hong Kong Island. Take a stroll day or night – it always has a nice atmosphere. You’ll find photographers ready to snap you in front of the skyline if you want a decent photo too. Harbour Light Show – This is the grandest free light show you’ll ever see. Every night at 8pm, 44 buildings on both sides of the Victoria Harbour synchronise their lights and show off lasers in time with music. You’ll need to be on the harbour walkways on either side of the harbour to hear the music and get the best view of the lights. The narration is in English on Mondays, Wednesdays and Fridays and we think the best view is on the Avenue of Stars. 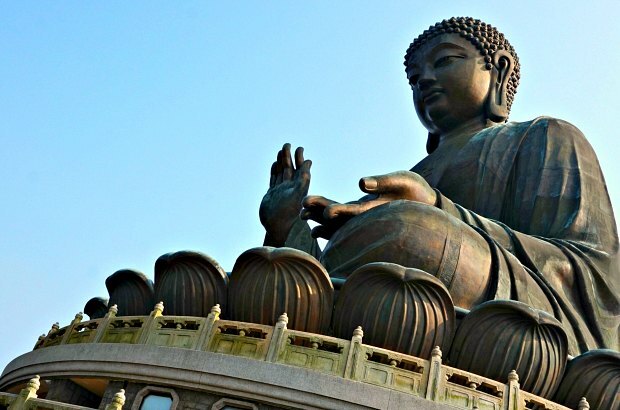 Lantau Island – This island is home to the world’s tallest seated outdoor bronze Buddha. It’s also a place of peace and tranquillity compared to Hong Kong Island and Kowloon. We spent almost a full day here and it’s one of the things we’re really glad we did. The Po Lin monastery at the foot of the steps up to the Buddha welcomes all – they were even offering free food samples when we were there. The Buddha is absolutely huge and the view is fantastic. You can take the MTR to get to Lantau Island but we went by high speed boat from the Central Ferry pier which was great fun. We then took a bus to the Buddha. Alternatively, consider joining the Organised Day Trip. 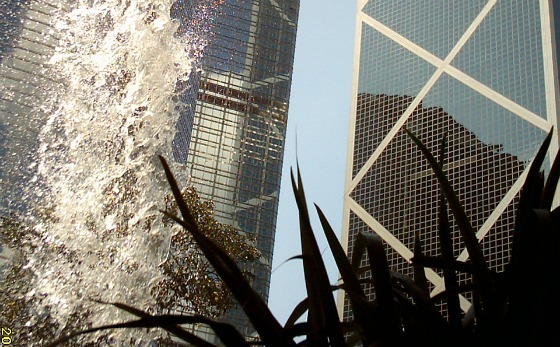 Hong Kong Park – You’ll find this 8 hectare park off Cotton Tree Drive near the Bank of China building. We stumbled on it by accident, but it’s beautiful and completely unexpected. Outside there are waterfalls, a lake, huge rock areas, streams, you name it and it’s all man made. You’ll also find a huge indoor aviary, an enormous conservatory for display plants, sports facilities and a 20 metre tall clock tower. The park serves as a true oasis from the hustle and bustle of the business district that surrounds it. Ocean Park – It’s a marine based theme park which seems to have something for everyone. 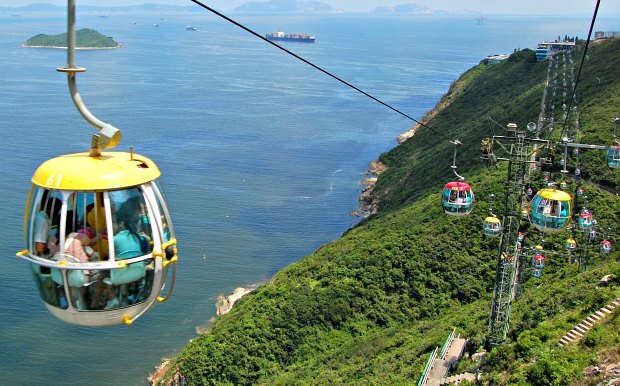 There are two sites within the park linked by an amazing cable car ride with lovely views. The first site deals with animals and it’s your chance to see the pandas (if they’re awake!) The second site is home to rides and roller-coasters. Check out latest prices here where you can buy in advance in US Dollars. Disneyland – This was being built last time we were in Hong Kong. 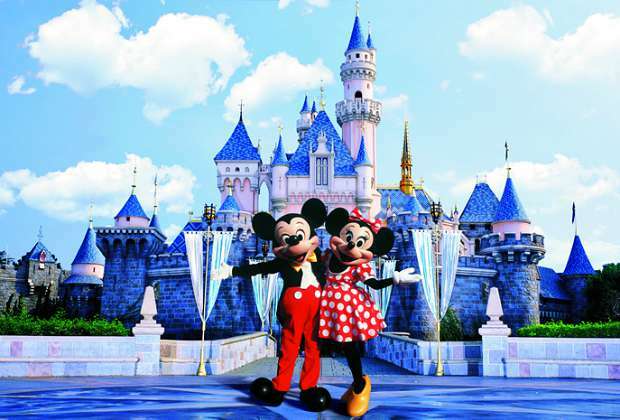 It’s on Lantau Island and is based on the Disney “Magic Kingdom” park. If you want to take the stress out getting to Disneyland Hong Kong, then check out prices for a Round-trip Transfer from Hong Kong Island. Think carefully about what time of year to go to Hong Kong. The monsoon season really is VERY wet and the heat and humidity can be unbearable in the summer. Next time we go, we’re aiming for late September, October, November or early December. 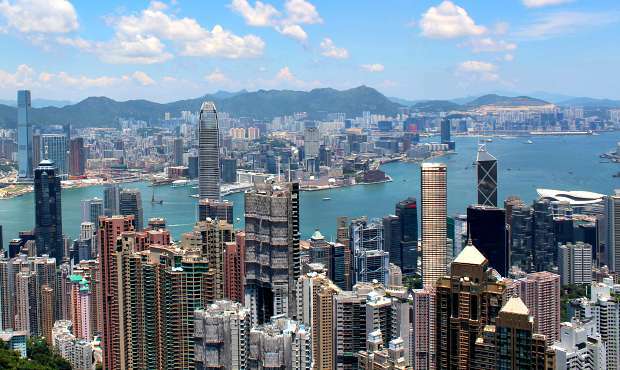 There are many tours and excursions you can take whilst in Hong Kong, details of which are on these Tours & Activities pages where you’ll find prices in US Dollars. Most popular is the Lantau Island Day Trip which consistently gets great reviews from other travellers. 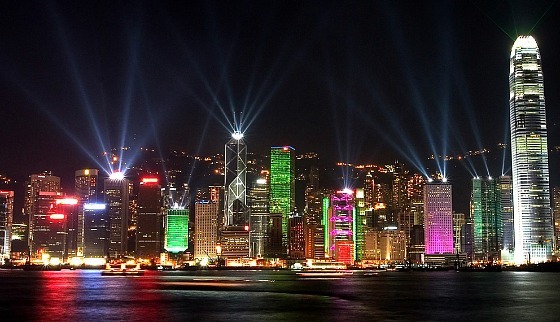 Also popular and highly rated are the Macau Day Trip and the Hong Kong Island Half Day Tour. If you prefer prices in UK Pounds, you’ll find them here. 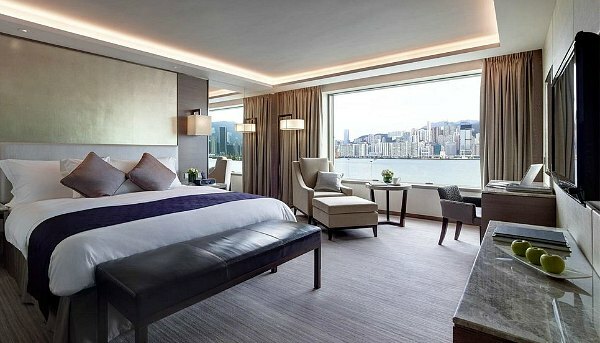 We stayed at the Intercontinental Grand Stanford right on the harbour at Kowloon and we paid extra for a harbour view room. It was an amazing experience to see the lights come on at night on the skyscrapers on Hong Kong Island and watch the boats and ships in the harbour going back and forth. The hotel was absolutely lovely, with truly luxurious rooms and superb service. Breakfast was good too and the restaurant overlooks the harbour. The public transport is amazing in Hong Kong. It’s reliable and cheap almost everything is in English as well as Chinese so there are no big language problems. You’ll find that most sights are with walking distance anyway, but if you have to take a bus, tram or use the MTR it’s very simple.